"This sandwich gets a crunchy finish with chips embedded into the bread. I use very special potato chips that were sent to me from Pennsylvania by my dear friend, MP. But if you can't find Utz®, your favorite chip will work just fine. Serve with more chips and pickles." Mix tuna, 1/4 cup mayonnaise, and Dijon mustard together in a small bowl. Stir in pickle and red onion. Spread tuna mixture on 2 slices of bread. Top each with 2 slices of Cheddar cheese. Spread 1 tablespoon cream cheese on each of the remaining 2 slices of bread. Place on top of the Cheddar cheese. Place crushed chips in a shallow bowl. Spread top side of each tuna melt with 1 1/2 teaspoon mayonnaise and press into the chips. Repeat on other side. Heat a dry grill pan over medium-high heat. Toast tuna melts until golden brown, about 2 minutes per side. Do you like your melt crunchy? 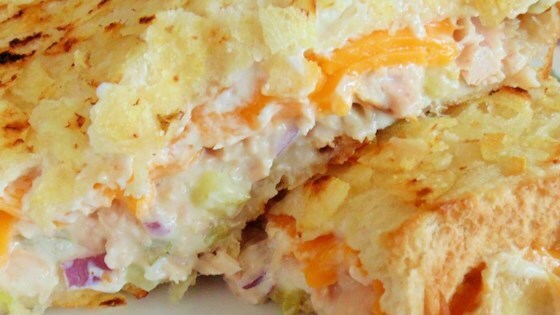 Use a panini press instead of a grill pan to toast the tuna melts if preferred. Left out the mustard. Used sharp cheddar. Need to crush the chips a bit finer next time. Mmmm, mmmm good. I used tuna in water and it turned out good. I would drain the tuna next time because it's a little runny which makes this very messy to eat. Good, but SOOO rich - way too rich for our taste. I prefer simple tuna sandwiches, but it was fun to try.